Outdoor String Lights Are NOT Just for Christmas! Outdoor string lights provide more than light - they can provide a festive atmosphere or an elegant ambience. They can be powered by electricity, battery or the sun. No matter what style you choose, they make for great outdoor party lights. Place them in the bushes, string them in the trees, or wrap them around your deck railing. Battery operated lights make it possible to place your patio string lights anywhere you want. Without any need for cords or electricity you don't need to worry about any outlet. Look for those that state they are outdoor lights. Sometimes the string of lights is water resistant but not the battery pack. Others will list if they are both water resistant for outdoor use. Warm lights have a more yellow tint while the cooler lights have a more blue tint. I like the sets with timers. To set the timer for the first time, turn them on to the setting (T) at the time you want them to automatically turn on each evening - let's say 7:00 PM. That means your lights will go on automatically every night at 7:00 and then after 5-6 hours they will automatically turn off. Most string lights are now using LED lights. They are so much better! They virtually will never burn out like the old Christmas string lights. This set of 50 lights can be used anywhere since it's battery operated. Solar LED string lights are becoming more popular and more available in an assortment of colors and styles. These string lights are not just for outdoor decorating at Christmas. Use them for your outdoor party lights or for your own enjoyment. These lights have come along way. 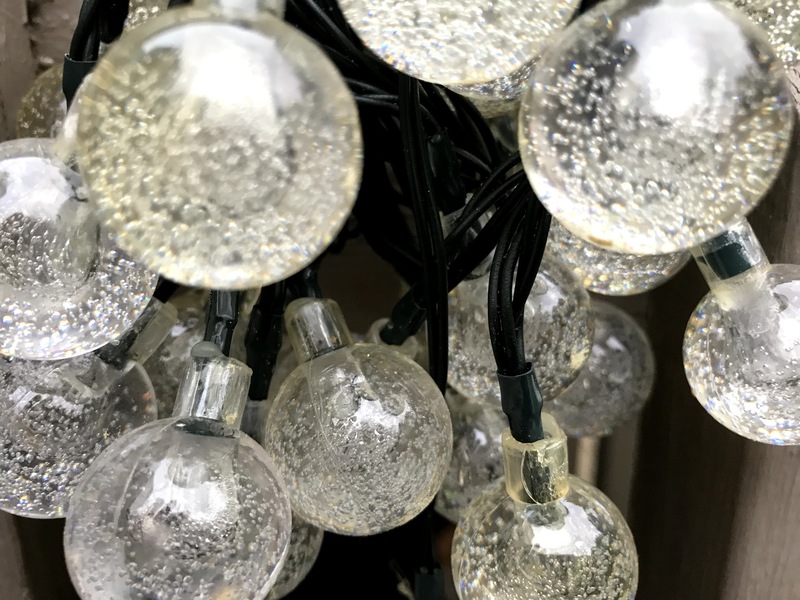 What can be easier than letting the sun power your patio string lights - no need for any batteries or electricity so you can place them anywhere that gets full sun to the panel. We love how they automatically come one every night and often still glowing to greet me when I get up early in the morning before the sun comes up. They are not just for pool party decorations - leave them out year round for your enjoyment. Using sunlight for power, outdoor solar lights can be placed practically anywhere without annoying cords or the need for nearby outlets. They stay illuminated for 8 - 16 hours depending on lighting conditions. The lights turns on/off automatically via a built in light sensor. Paper lantern string lights can come in bright bold colors like turquoise, orange, and yellow or for a softer look, try pastel colors or all white. String them around your patio umbrella or in a nearby tree. Hang them on the deck railing or along the pool fence. This set of lanterns is actually not made of paper but of nylon - which is a big plus for me. Many a time I have set out paper lanterns only to have an unexpected or expected rain shower wreck them. Each lantern is approximately 3" diameter and are expandable. Meaning you can plug in several strings together. Star string lights aren't just for the Fourth of July. Use them year round and hang them on your pool fence, deck railing, around a bush or on a trellis. These star shaped lights can be used as outdoor string lights. One set is a strand of 50 warm white lights. The brightness can be controlled with the included remote and adjusted to your preference. These battery operated string lights use 3 AA batteries - which are not included. Set the timer for 6 hours on and 18 hours off for automatic lights every evening.